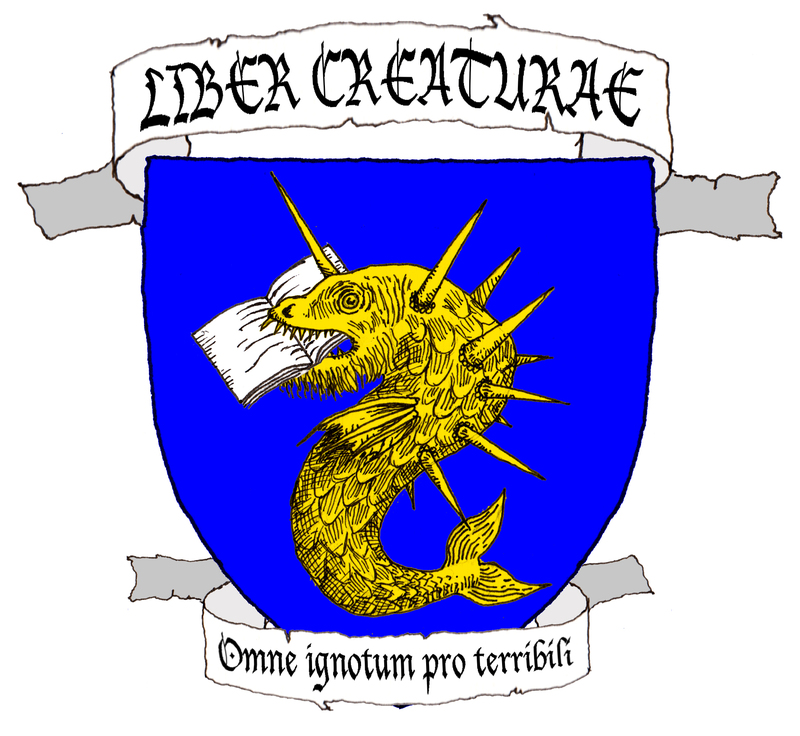 “Fearsome Critter” is a catchall term used for a mixed and problematic grouping of creatures. They are all said to hail from lumberjack tall tales, primarily from the American northern lumberwoods but including a few representatives from southern states. They share the same folkloric origin that gave us the likes of Paul Bunyan and Pecos Bill, but instead of folk heroes, they are said to be pranks, bogeys, stories told to frighten greenhorns and tenderfoots. Experienced lumberjacks can sit back and get a good laugh after sending someout out on a futile snipe hunt, or snicker to themselves as the newcomer starts checking behind him for a stalking hidebehind. The Australian drop bear is a non-American example of this sort of creature. The term “fearsome critter” was used by Tryon as a title for his lumberwoods menagerie. “Fearsome creatures” is used by Cox, and predates Tryon’s “fearsome critters”, but the engagingly vernacular “critter” designation has proven more popular. Almost all fearsome critters can be traced back to a handful of references. The oldest and most venerable is Cox’s Fearsome Creatures of the Lumberwoods with a Few Desert and Mountain Beasts from 1910. Borges’ excerpt of the Squonk entry ensured its fame among modern readers. Kearney collected several tales in his 1928 book The Hodag and other Tales of the Logging Camps, which takes a more narrative approach to the subject. The “Fauna of the United States” section in Borges’ book is traceable to Brown’s 1935 pamphlet Paul Bunyan Natural History. Finally, the spiritual successor of Fearsome Creatures was Tryon’s 1939 Fearsome Critters; both of these books illustrate each individual entry, and provide a mock Latin name for their critters. The Cox and Tryon books are the touchstones of fearsome critterology. Fearsome critters as a group are not well unified or verified. Some have entered the public consciousness and cemented their folkloric status beyond any reasonable doubt (Rhinelander’s own Hodag, the dreaded Hoop Snake, the elusive Snipe). Others have become cryptids (the possibly-feline Santer), or were the subject of elaborate hoaxes (the Hodag again). Some may have more ancient roots in Native American folklore. And then some may be complete fabrications by Cox and Tryon. With no references to speak of, Cox and Tryon’s accounts are hard to verify, unless corroborated by themselves and others. Cox’s description of the Hugag is almost entirely different from Tryon’s; in addition, it seems to be an Americanized retelling of Pliny’s Achlis. Cox gives a description of the Hodag that is completely at odds with the well-known one – was this an attempt at personalizing and “claiming” it, or a bona fide regional variation? Was Cox’s Snoligoster a completely reupholstered Snallygaster, with added casual racism? And, of course, it is unlikely that lumberjacks devised intricate Latin names for their critters. Keeping all this in mind, it is hard to separate genuine lumberjack folklore and literary jokes. Inasmuch as they don’t exist either way, and that popular encyclopedias of teratology such as Rose’s works have brought them to a larger audience, they are covered in ABC, with doubts and reservations added where necessary. In cases where Latin names are given, the author will be specified unless they are single-referenced. Kearney, L. S. (1928) The Hodag and other Tales of the Logging Camps. Democrat Printing Company, Madison.